Kahaluʻu, blessed with an excellent water supply fertile soil, supported a large pre-contact population of both commoners and chiefs. Many house sites, heiau other habitation ruins, and petroglyphs are located at or near Kahalu’u Bay, which was a focal point for the community. Probably the most striking feature on the shoreline is the ruin of the great breakwater that once entirely enclosed Kahaluʻu Bay and Kealialia, the tidal lagoon of the Keauhou Beach Hotel. Known as Paokamenehune, the "menehune breakwater," the structure originally formed a semicircle, 3,900 feet long. Most of the huge boulders of which it was constructed have been scattered by the endless batterings of high surf, storm waves, and tsunami. Tiny and much-photographed, St. Peter's Catholic Church still stands on the shoreline of Kahaluʻu Bay. Beside it is another important site, Kuʻemanu Heiau, where the chiefs prayed for good surfing conditions. After surfing, they rinsed off in an adjoining spring, Waikuʻi, which is now a stagnant pond. Another larger pond nearby located to the rear of the beach was known as Waikuaʻala. Kahaluʻu Beach Park became an official county park in 1953, when the Bishop Estate, the former landowner, leased the property to the County of Hawaiʻi. Thirteen years later, in a dedication ceremony held on September 24, 1966, Richard Lyman, a trustee of the Bishop Estate, presented Mayor Shunichi Kimura with the deed to the property, thereby assuring Kona residents of a permanent public beach park in the area. Since then, all of the remaining shoreline property south from Kahaluʻu Bay to Keauhou Bay has been developed for residential and resort purposes and is now known inclusively as Keauhou-Kona. 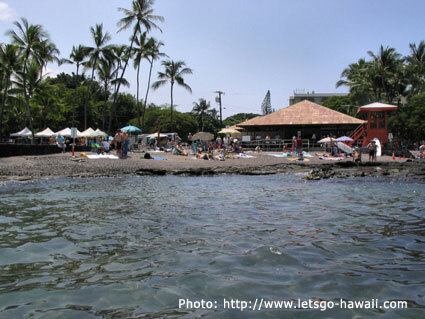 Kahaluʻu Beach Park is one of the most popular swimming and snorkeling sites in the district of Kona. It attracts large crowds of beachgoers, many coming in family groups, particularly on weekends and holidays. The white sand beach speckled with black lava fragments provides a good area for sunbathing and is also an easily negotiated entry/exit point to the bay offshore. The bay offers excellent opportunities for snorkeling and nearshore scuba diving in waters that are protected by a fringing reef and are generally current free under ordinary ocean conditions. In addition to swimmers, snorkelers, and scuba divers the bay attracts local fishermen, who use surround-nets, hukilau nets, and throw-nets to catch their favorite fish. The bay has never been designated a conservation district because it has always been a source of seafood for Hawaiian fishermen. During periods of high surf, experienced surfers and bodyboarders may find some excellent waves at the seaward edge of the reef in the outer area of Kahaluʻu Bay. These same waves, however, generate an extremely powerful rip current that runs north from Kuʻemanu Heiau, along the rugged shoreline rocks, and out into the deeper waters beyond, where it dissipates. A person who has been caught in this rip and finds himself being towed out to sea can regain the safety of the beach only by swimming south around the surf line and then riding back in with the incoming waves. Many unwary and uninformed visitors, however, when trapped in the rip, attempt to swim against the current, often to the point of exhaustion when they cannot swim another stroke or even tread water-critical difficulties that may lead to drowning. Others caught in the rip, finding that they are being swept away from the beach, attempt to go ashore through the heavy surf pounding against the shoreline rocks; these attempts invariably prove equally disastrous. County lifeguards and fire department rescue personnel make more rescues at Kahaluʻu Beach Park than at any other beach in Kona. They suggest that rip current victims who go with the current and then float offshore beyond the surf until help arrives stand the best chance of survival. Kahaluʻu Beach Park lies along Aliʻi Drive. Facilities include picnic pavilions, restrooms, showers, drinking water, a lifeguard tower, and a parking area.